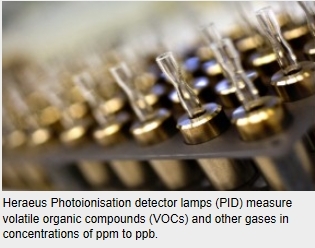 Heraeus Noblelight, one of the technology and market leaders in the field of specialty light sources, has published its latest application note on Photoionisation Detector Lamps (PID) lamps. PID lamps are at the heart of gas detection systems: why is a good PID lamp important and how to get the best out of it are explained in the latest application note. Lamp spectra, lifetime and the best practice for ensuring long term stability, plus why PID lamp quality is important are topics discussed. PID lamps are most commonly used in Hand-Held Gas Detectors for VOC detection, gas chromatography (GC), trace gas monitoring and sample ionisation for mass spectrometry. “The purity of the spectrum is important for good lamp operation. The presence of secondary lines due to contaminants can affect the intensity of the primary lines, lamp intensity and lifetime”, explains Stephen Attwood, Sales Director of Heraeus Noblelight Analytics. However, contamination of the lamp can occur at higher wavelengths due in main to hydrocarbons. Whilst this does not interfere with the VUV lines in terms of detection of VOCs, the contamination absorbs some of the energy from those lines, resulting in decreased sensitivity and a shorter life time. Heraeus PID lamps proved to last more than 8000 hours. The spectrum shows the difference between a Heraeus lamp and another lamp in the UV/visible range. Reasons for long term spectral purity of Heraeus lamps are discussed in the high quality materials section. Please refer to the Heraeus website www.heraeus-noblelight.com or contact Heraeus for the complete application note: hna-analytics@heraeus.com. Heraeus Noblelight, leading manufacturer of specialty light sources, is a global player in the industry. Deuterium and Hollow Cathode Lamps, PID and specialty lighting from Heraeus are not only engineered for long lifetime, but also for the highest precision and stability. Extensive testing of all light sources ensures they meet the specifications needed to give reliable and reproducible performance for the most demanding applications. Heraeus technology provides high quality and capability in modern analytical equipment, reducing Cost of Ownership and supporting the most sensitive analysis. Heraeus Noblelight develops and manufactures specialty light sources and power supplies for a wide range of analytical applications. Heraeus experts are available to support instrument manufacturers with customised designs for future developments.